Home / Blog / Seoul Eunpyeong-gu, South Korea, Shut down the illegal dog meat farms, slaughterhouses, markets and restaurants. 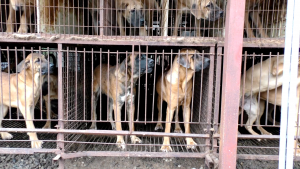 In Seoul Eunpyeong-gu, there are countless markets and restaurants, where there are dogs suffering, they are tortured their entire lives and slaughtered in the most inhumane ways, such as by electrocution, hanging or beating; and then thrown into boiling water – sometimes while they are still alive, the meat is then sold to consumers. Many of these dogs are abandoned and stolen former pets, and they end up in the dog meat industry, these dogs are subjected to the same cruelty. Photo: The Korea Observer. Documentary: The Dog Meat Professionals: South Korea. A Search Engine reveals the sickening scale of Seoul Eunpyeong-gu’s dog meat demand. Two search results on Naver (the most popular search engine in Korea) – the first one was for so-called “Health Food Shops” which commonly sell dog elixirs and cat elixirs (also known as dog soju and cat soju); and the second one was for “dog meat restaurants”: 79 Health Food Shops; and 45 dog meat restaurants in and around Seoul Eunpyeong-gu. Even if half of these ‘Health’ Food Shops and restaurants serve dog and cat ‘ingredients’ in one form or another, just imagine how many dog/cat slaughterhouses must be present in and around Seoul Eunpyeong-gu in order to supply all of these outlets. Subject: Seoul Eunpyeong-gu, South Korea, Shut down the illegal dog meat farms, slaughterhouses, markets and restaurants. This needs to end once and for all! This is extremely inhumane and heartless, out an end to all dog and cat meat trade and end this horrible dog meat festival as well! Have a heart and ask yourself, would you do this to humans then don’t do it to dogs or cats! PLEASE, STOP KILLING INNOCENT ANIMALS!!! IT IS A CRIME!!! Cruelty to animals is a crime against humanity and shall be treated as such. Severe penalties must be imposed on those humans involved in it. Dogs and cats are not food, they are companions, we have an obligation to care for them as we domesticated them. Those evil, backward, primitive, sadistic people who engage in barbaric animal slaughter, must be eliminated from the face of the earth. They are the real obstacle to our prosperity and happiness. It must be an eye for an eye and a tooth for a tooth, if the good and the wise are serious to make this world a better place. This is barbaric even though it’s cultural. These animals depend on us and they are cruelly raised, treated and then killed in the most horrifying manner. This practice paints a terrible black spot on Korea and other countries that do this. I will not travel to Korea or spend any tourism money (and I travel all the time) until Korea changes their policy and stops dog and cat consumption.